The tarot meditation on the upright Star card represents hope, healing, growth after a series of difficult trials. Star reversed tarot meditation is the antithesis of all of this. The loss of hope, stagnation, and being unable to see a way out of the trials in which you find yourself. Choose a cloth that represents a feeling of loss and hopelessness to you, and place a matching candle at the top of the cloth with the card in front of you. As you begin to focus on this meditation, think about what it feels like when every light has gone out in your life. When you can’t see a way out, or any end to your circumstances. That is the feeling you are trying to capture as you begin this trip. As the meditation takes hold, let the conscious world drain away. You will find yourself in utter blackness, the floor beneath you is cold and damp, and you feel simultaneously claustrophobic and lost within a great vastness. You call out for help, hearing only the echo in the deep black, but coming from an indeterminate distance. You begin walking, but every direction you go you encounter no wall, the floor beneath you changes in no way. How will you find your way out of this place, there is no light, no wind, no discernable sound or surface except the floor. You begin to despair of any respite, any way out, and your mind begins turning in on itself devouring any vestige of light or hope that tries to take root. 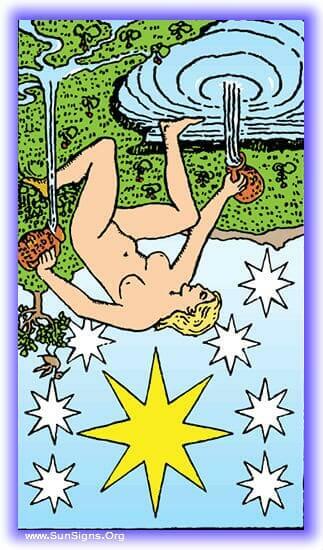 Rising up out of the Star inverted card tarot meditation, take this sense of hopelessness with you at first. Remember times you felt this way, how you found your way out. Remember that there is always hope. Always a way to see yourself free of the situations that seem hopeless. Time will move on, and take the bad times with it. Your notebook should be used to record these, and as you write down your experiences, leave the bad feelings behind. Walk in the sun, listen to cheerful music, or watch an uplifting movie to free yourself of these feelings. The Universe does not intend for you to stay in these moments, and the momentum of time will set you free. How To Do Water Meditation? How Do I Summon A Dragon Familiar?